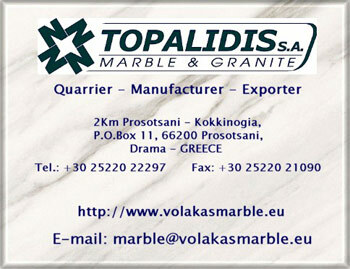 Welcome to the web site dedicated to Greek marble Volakas. A white marble, very popular in the international natural stone market. Information about White of Volakas marble. A Greek stone with white background and fine light grey or purple veins. located on the mountains of Macedonia in Greece. Stone tiles, slabs & blocks, production procedure & quality control. The dolomite stone grades & selections. Volakas White types, all known names of the unique white marble. Mineral composition, chemical analysis, physical & mechanical properties. Run into a stone wall? Not any more. All info about industry, quarrier, manufacturer & supplier of Volakas marble. Samples and how to obtain yours.